Fascinated by the natural processes of growth and decay, I push boundaries to capture the bold and fragile essence of life. 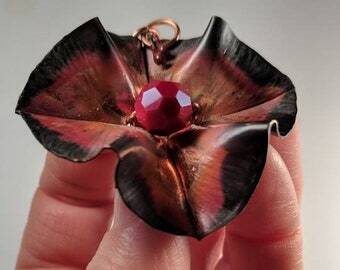 Circle of life flower Pendant - Foldformed Copper, Patina, Torchfired Enamel, Original design. Wear a flower around your neck every day. 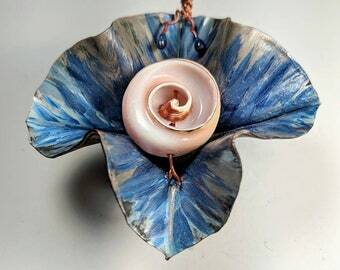 Ocean Blue shell Flower Pendant - Foldformed Copper, Patina, Torchfired Enamel, Original design. Carry the ocean with you wherever you go. Vintage Jet Black Glass Elegant Forest Flower Pendant - Foldformed Copper, Handpainted, Torchfired Enamel Tendrils, Original design. Flame Red Faceted Glass Copper Flower Pendant - Foldformed, Hammered, Natural Firescale, Torchfired Enamel, Original Design, Handmade. Heart Red Rippling Copper Pearl Flower Pendant - Foldformed, Patina, Enameled Tendrils, Original Design, Handmade. Fireworks Flower Pendant with Pearl Center - Foldformed Copper, Handpainted Patina, Torchfired Enamel Tendrils, Original Design. Handmade. This is a truly lovely, unique, and stunning piece. It arrived very quickly, practically overnight. The seller also followed up to make sure it had arrived on time and that I was satisfied. I am, very much! Natural Copper Flower Pendant with Czech Glass Focal Point - Foldformed Copper, Handpainted Patina, Torch-fired Enamel, Original design. A Force Of Nature: Fascinated by the natural processes of growth and decay, I push boundaries to capture the bold and fragile essence of life. I love the way metal feels, its weight, its changing temperatures, its smoothness and textures, and the way it moves, with each hammer blow shifting the molecules mathematically, the way it takes color from the torch or patina and enamel. I love its permanence, how it will last longer than any of us. I love the way my ideas evolve as I create new work. Each piece is an exploration in form and represents the beauty of the natural world in a lasting way. I've been exploring natural forms for as long as I can remember. I've always made jewelry, as a child using found objects like bottle caps, as an adult with lost wax casting, precious metal clay, fabrication and most recently foldforming. I'm inspired by colors, shapes, and textures found in nature. I like to play with color that mimics moss, lichens, leaves, blooms, pods, and buds. I enjoy incorporating natural elements like shells, pearls, coral, fiber, glass, etc., but also like vintage glass, stones, and unusual beads. Some of my work is available for purchase at Pearl Gallery & Framing. Please check with the store to see what's available. Lover of flowers, fire, metal, and water.